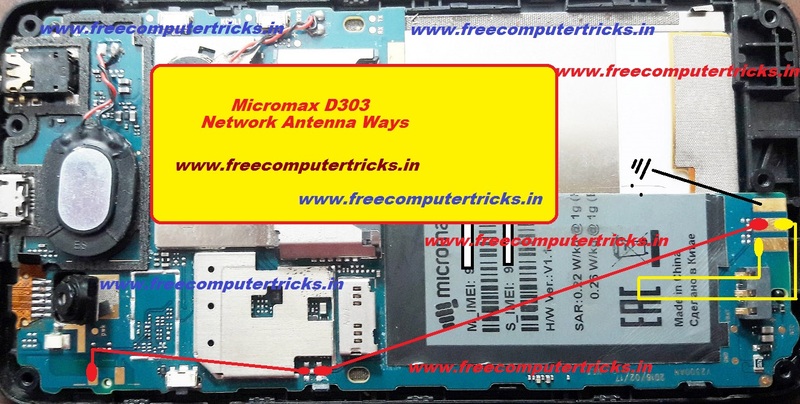 Here we will show you, how to solve Micromax D303 network problem? If the phone OK with the firmware and IMEI then you can try the following hardware solution and network ways to the external antenna flex or external antenna signal receiver main connector. As shown in the below image check the connectivity if the connection is not good or broken then apply jumper. If the external antenna is not good connect the two antenna connector point with a insulated copper wire (at-least 3 inch wire) it will work as external antenna. Micromax D303 network solution, Micromax d303 no network, emergency calls only, no service, failed to search network, failed to register on network, error while searching networks etc. Please see the below image and apply jumper to the antenna point. Apply jumper as shown in the above image and you will able to solve network problem in Micromax Android smart phones and here is the example of Micromax D303.